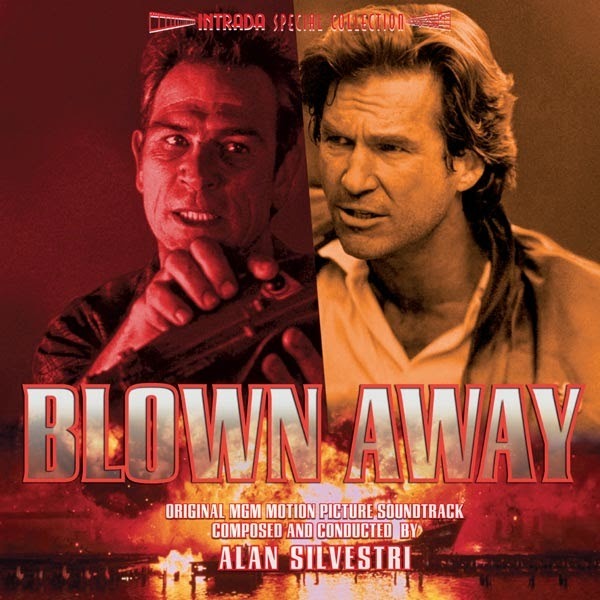 For the 1994 MGM film Blown Away, composer Alan Silvestri provided a dynamic, dramatic and ultimately explosive score. Silvestri’s powerful music wound up almost entirely unheard outside of the finished film—and even within the film, it was significantly edited and frequently pushed up against attention-grabbing songs from the likes of U2 and October Project. With this new release, listeners can at last experience Silvestri’s score for Blown Away in its full and unadulterated form—a thrilling marriage of action and passion, and a virtuoso example of how music for bombs can be far more than simple bombast. To create this CD, Intrada was given access to the composer’s own complete two-track digital scoring session masters. The results sound crisp and vibrant on this premiere release. Blown Away centers around Jimmy Dove (Jeff Bridges), a senior member of Boston’s bomb squad who has a reckless propensity for putting himself in harm’s way. Dove is motivated by a past tragedy, and only two people know his dangerous secret: his elderly Irish uncle, Max O’Bannon (Lloyd Bridges); and Ryan Gaerity (Tommy Lee Jones), an incarcerated terrorist and explosives genius who was deemed “too crazy” for the IRA. When Gaerity escapes on the eve of Dove’s retirement and begins a campaign of terror and revenge, it’s up to Dove, with the help of his cocky new partner Anthony (Forest Whitaker), to stop him before everything and everyone he loves is literally blown away. IT'S NOT GOING TO BE A BOMB! Just Announced, sneaking in another great release before the end of the year!